The 8558A 8.5-Digit Multimeter digitizes 5 million readings per second and can produce a minimum of 100,000 readings per second at 4.5 digits across GPIB, USBTMC or Ethernet. These instruments offer a straightforward, intuitive user interface and colour display with an easy-to-access configuration menu that makes it easy to train new users. A graphical display lets you easily visualize trends, histograms, complex waveforms, and statistics. Repeatable system-specific tasks can be automated quickly and easily. Fast, high resolution data capture gives you the quantity and quality of information you need for increased productivity and faster access to results and answers. In addition, for system automation (ATE) in labs and manufacturing test environments it is available with an emulation mode for Keysight 3458A. 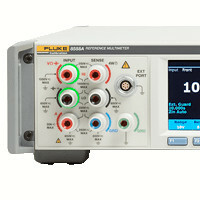 The 8558A works with Fluke Calibration MET/CAL™ Calibration Software, including in 8508A emulation mode, allowing you to increase throughput while ensuring calibrations are performed consistently every time. This software documents calibration procedures, processes and results for ease in complying with ISO 17025 and similar quality standards. To find out more, visit the product page linked to below where a data sheet is available. Contact Us or Call 01480 412451 for further details.